Chinese style food has been quite the hit at my house and I didn’t want to stop with just low carb Sweet & Sour chicken and General Tso’s Chicken. I made some fried rice to go with any Chinese style dish you make, quite similar to the real thing. I am sure you’ll enjoy it, and I’m sure you’ll be wanting a second serving once you have a bite. It does take a decent amount of work to make the fried rice, but usually I cook my chicken dishes in the oven and I have plenty of time to get everything ready for the fried rice. 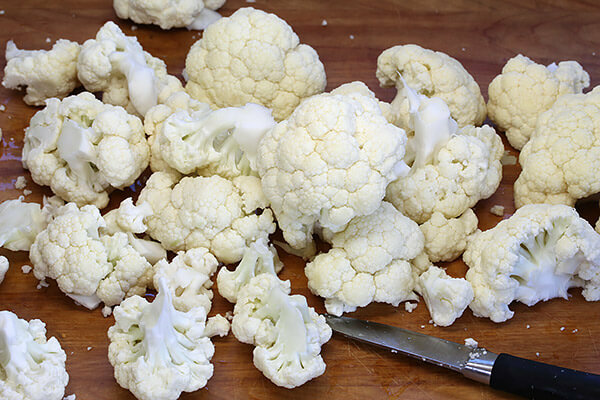 Most of the work goes into prepping the cauliflower, but once that’s done it’s a piece of cake. Not to mention, it’s well worth the effort. Getting some of the moisture out of the raw cauliflower is key here. You want it to fry up and become a little bit crispy. While my method works, it’s a lot more labour intensive than it needs to be. 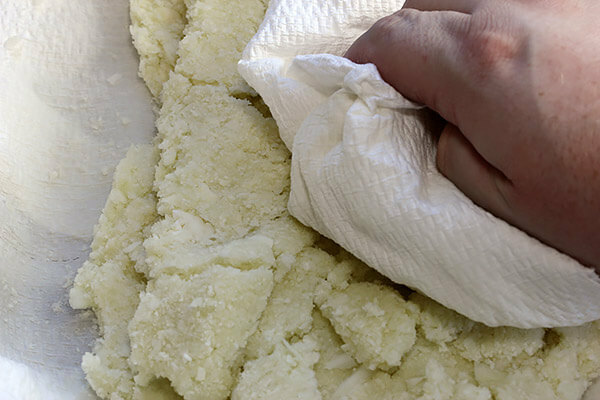 If you have a cookie sheet, I suggest spreading all of the riced cauliflower onto that and then using your own body weight as the force to drain the moisture out. 1. Get a large head of cauliflower and a knife. 2. 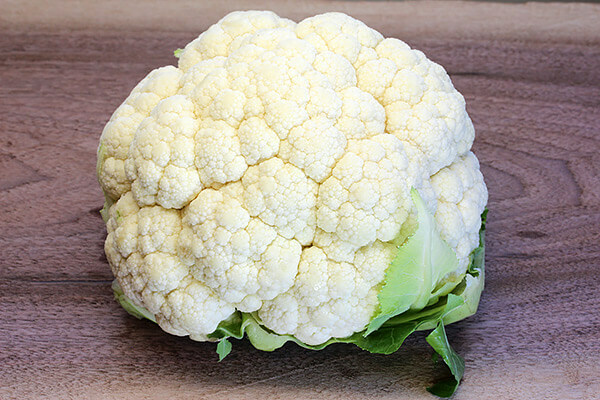 Cut up the head of cauliflower into florets. 3. 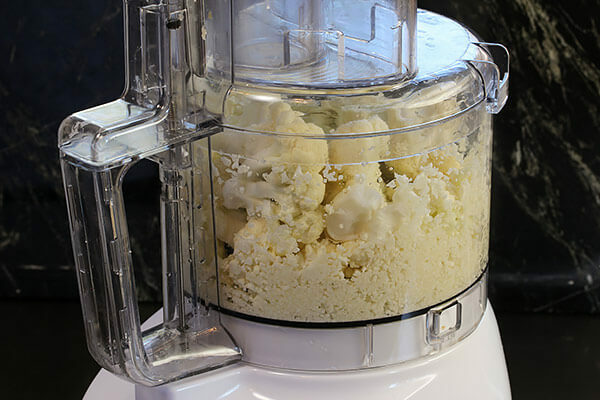 Put the cauliflower florets into the food processor and pulse it until it becomes a rice consistency. 4. 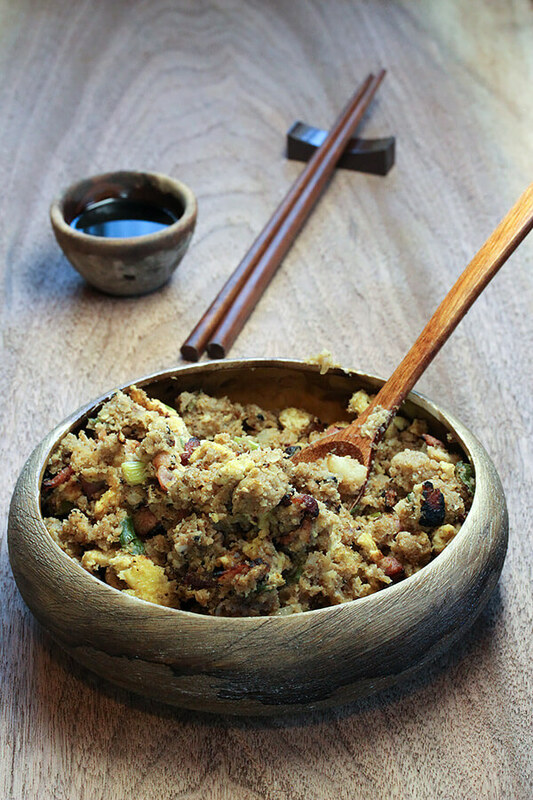 Transfer the riced cauliflower into a container or cookie sheet. Press all of your body weight onto a paper towel sitting on top of the cauliflower. The idea is to drain as much water as possible from it. 5. It should look a little bit like short grain rice once you finished. 6. 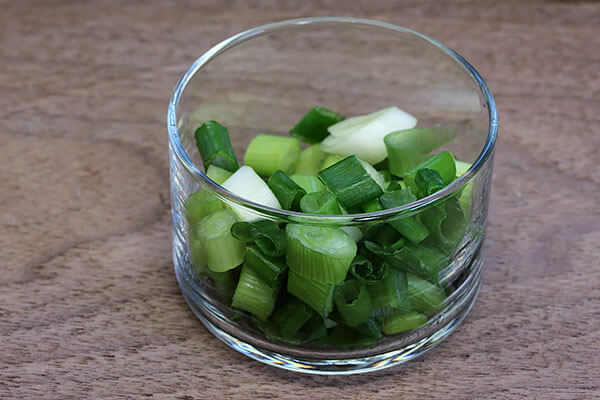 Chop up 2 stalks of scallions to put into the fried rice. 7. Slice some bacon into very thin strips, we’ll be using these later. 8. Put the bacon into the pan, we want to cook these until they’re extra crispy. 9. 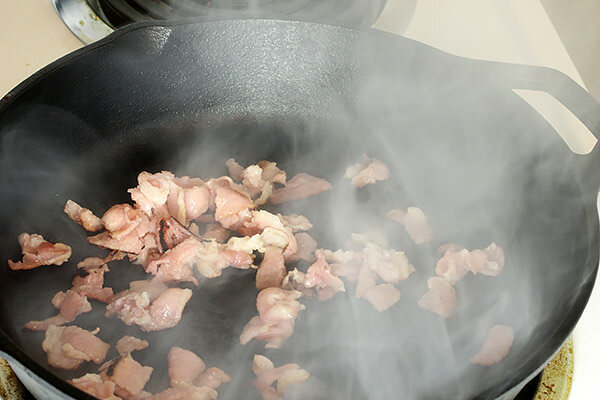 Once the bacon is around this stage, you can remove it from the pan. 10. Put it onto some paper towels to dry off and crisp up. 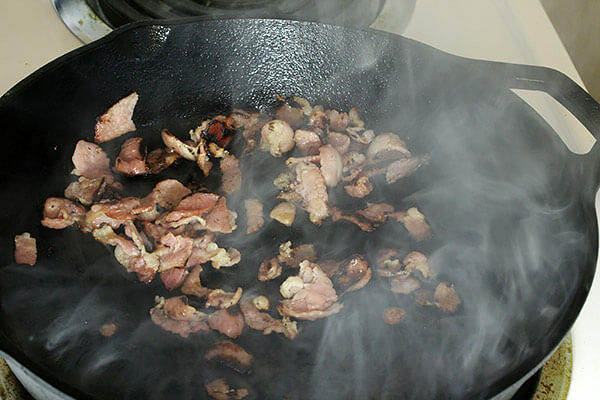 Keep some of the bacon fat in the pan. 11. Put the cauliflower over the bacon fat and allow it to cook for a moment. 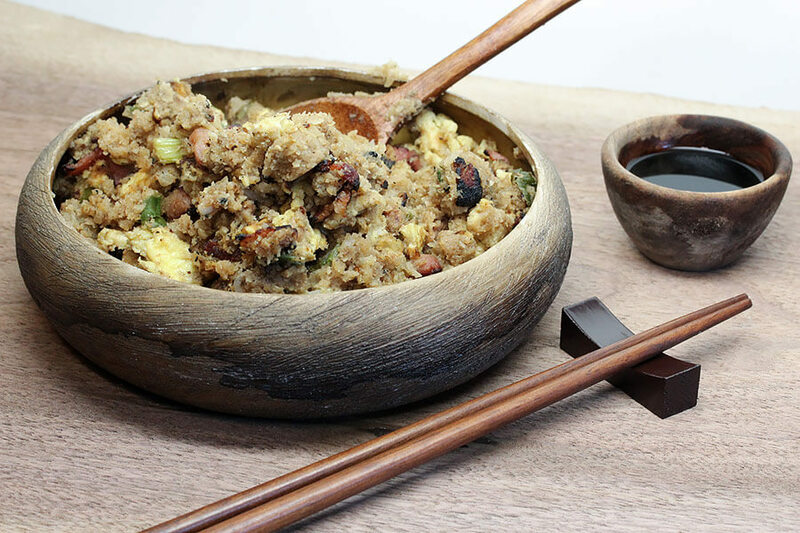 Add your soy sauce and fish sauce to the cauliflower fried rice and mix it well. 12. 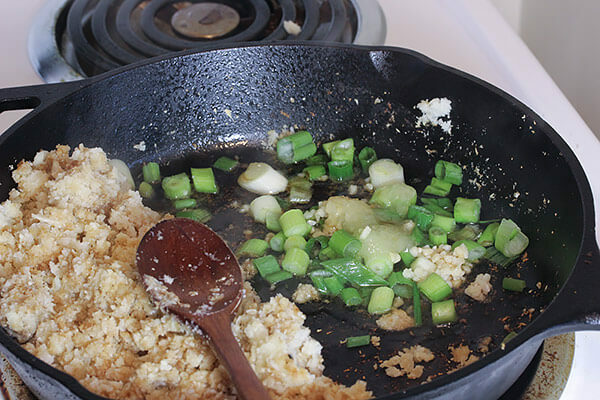 Put the cauliflower off to the side and add your sesame oil, scallions, garlic, and ginger. 13. 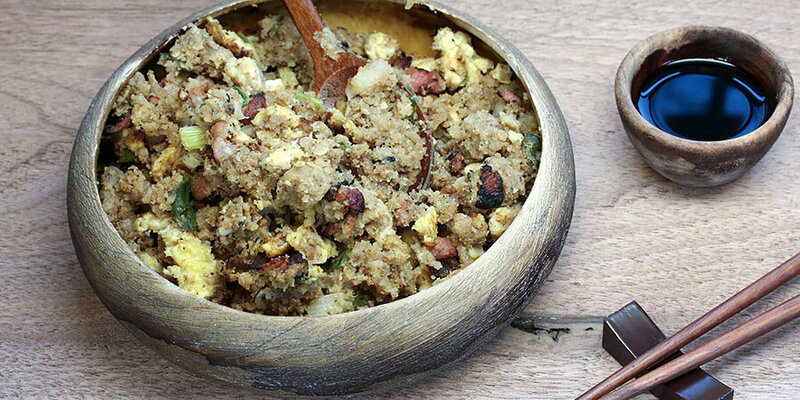 Allow this to cook for a minute and mix everything together well. You can add your pepper at this point. I usually go pretty heavy with the pepper because it adds a nice flavor. 14. 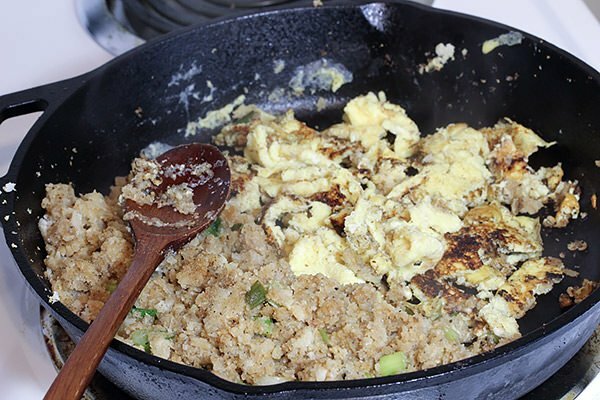 Push your cauliflower fried rice off to the side and add your 2 scrambled eggs to the pan. 15. 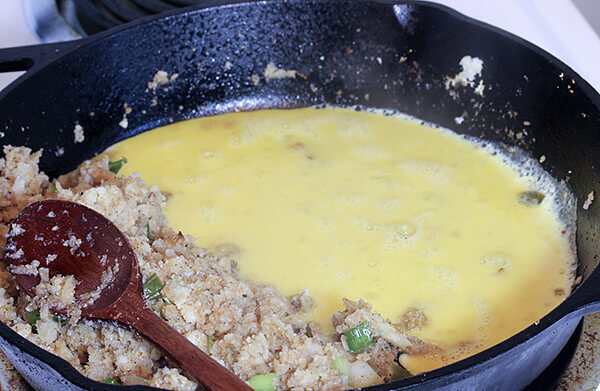 You want the eggs to get to an omelette consistency, so allow them to cook through before you flip them to cook more. 16. 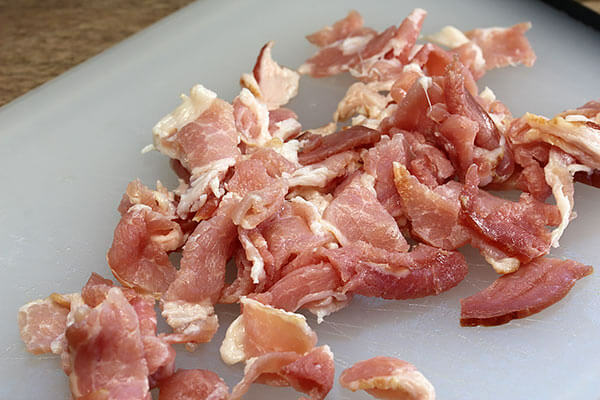 Once the eggs are cooked, break them up into small pieces and add your bacon. 17. Stir everything well and serve! This will make 3 servings, each being: 214.33 Calories, 16.11g Fats, 5.27g Net Carbs, and 11.15g Protein. 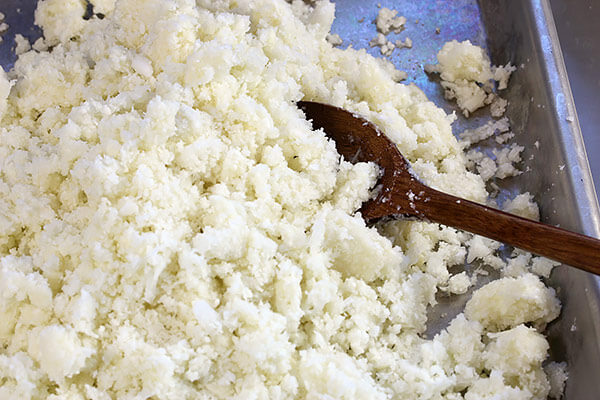 Rice cauliflower florets in food processor. 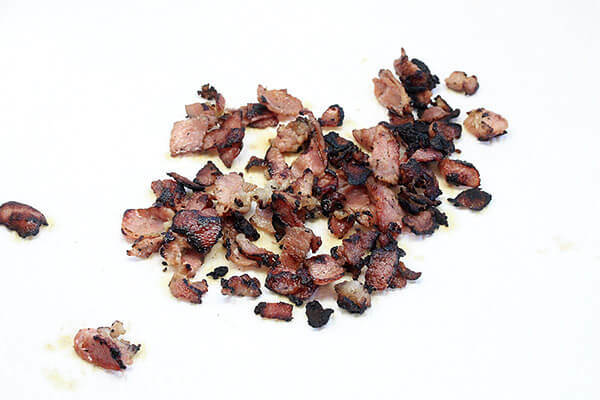 Fry bacon until very crisp, remove and let cool. Add sesame oil to pan and start to fry the cauliflower. 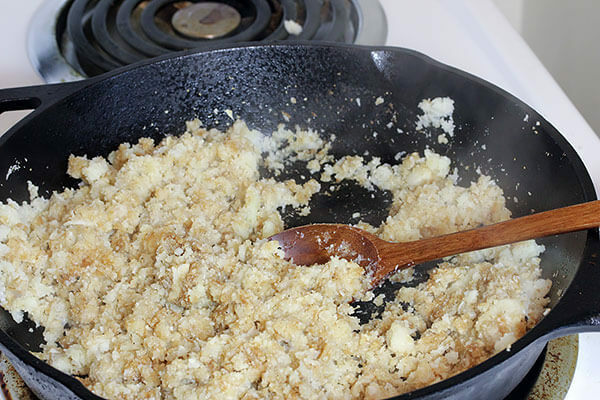 After a few minutes, push your cauliflower to one side of the pan, adding your garlic, ginger and scallions to the empty side. Add fish sauce, soy sauce and black pepper to the "rice". 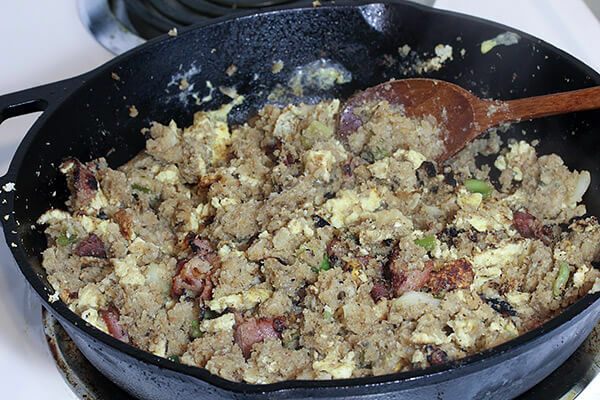 Mix everything together and allow it to fry for a few minutes. Push all your ingredients to one side of the pan again. Add your eggs and allow them to cook. Add your bacon and mix everything in well, chopping the egg up to form smaller pieces.